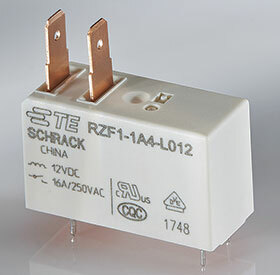 TE Connectivity’s RZF series power relay offers through-hole technology (THT) printed circuit board (PCB) terminals plus top-mounted 4,8 x 0,5 mm quick connect tab terminals for load connections. Its low-profile design results in a mounted height about 19% less than that of some previous generation PCB relays with similar features and top-mounted tabs. Contacts in a 1 form A (normally open) arrangement are rated 16 A at 250 V a.c., resistive. The 530 mW coil is offered in 5 V through 48 V d.c. versions. The relay complies with IEC 60335-1, 5th edition (GWT) and is UL recognised, VDE approved and CQC certified. It is suitable for applications such as microwave ovens, water heaters, cooking appliances, air conditioning and industrial/commercial equipment.